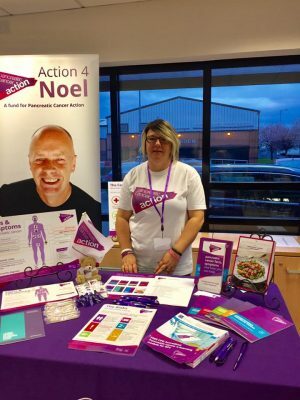 Action for Noel, in memory of Noel Irvine, is a Pancreatic Cancer Action fund aimed at raising awareness, educating the medical community, supporting patients and fund research into improving earlier diagnosis in Northern Ireland. Noel Irvine died of pancreatic cancer aged 54 just seven months after diagnosis. His wife, Kerry Irvine, who had never heard of the disease before his own diagnosis, has been determined to raise funds and awareness of pancreatic cancer to drive earlier diagnosis and give patients now and in the future a better chance of survival than Noel did. Pancreatic cancer has one of the lowest survival rates of all 21 common cancers – just three percent of patients survive. This among the worst in Europe and this figure has not changed for over 40 years. Pancreatic cancer is anticipated to move from the fifth to the fourth leading cause of cancer death in the UK by 2030.